Naviga verso Isla Mujeres per una divertente giornata sulla spiaggia in questo tour all-inclusive con partenza da Cancun. Con l'attrezzatura professionale da snorkeling fornita certificata da National Geographic potrai esplorare le acque cristalline in due luoghi fantastici. Quando sarai affamato ci saranno un pranzo a buffet in stile maya e un open bar ad aspettarti allo stabilimento balneare per placare il tuo appetito. Goditi il tempo libero per acquistare regali e souvenir in centro, e scopri i canali di Isla Mujeres, definita la Venezia di Cancun. Il trasporto in hotel è incluso. Dopo il servizio di prelievo la mattina presto da Cancun o dalla Riviera Maya, viaggia in un pullman con aria condizionata fino al porto. All'arrivo potrai gustare una colazione leggera ascoltando una panoramica del programma delle attività del giorno. Sali a bordo della barca e sosta presso la prima delle due tappe per lo snorkeling. 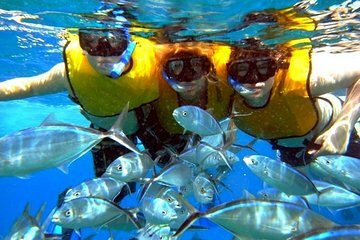 Approfitta dell'attrezzatura professionale fornita per lo snorkeling e certificata da National Geographic, e divertiti alla scoperta della vita marina. Dopo circa 45 minuti ci si dirige a Playa Norte, considerata una delle migliori spiagge del circondario. Durante l'ora che si trascorre qui, scopri le acque poco profonde con la sabbia bianca e i pesci colorati. Successivamente potrai trascorrere un'ora nel centro di Isla Mujeres, esplorando in modo autonomo i negozi di gioielli e di souvenir e le gallerie d'arte. Poi, di ritorno sulla barca, naviga attraverso i canali di Isla Mujeres, la Venezia di Cancun. Ammira le case e i porticcioli lungo il percorso, sosta presso uno stabilimento balneare per un gustoso pranzo a buffet: pesce in stile maya tikin-xic, insalata croccante, del riso in stile caraibico e bevande dall'open bar casalingo. Dopo esserti rilassato allo stabilimento balneare per circa due ore, si prosegue per il tempio maya di Ixchel (la dea della fertilità dei Maya) e il museo di scultura subacquea. Durante il viaggio di ritorno, l'equipaggio accende la musica. Sorseggia una bevanda fredda a bordo mentre il sole tramonta. Sbarca al porto di Cancun Hacienda Del Mar e usufruisci del trasporto verso il tuo hotel. The tour guides were fantastic. Always making sure you had drinks and were comfortable. The swimming on the north side of the island was gorgeous and lunch was well prepared. My ONLY issue was the blaring music. I like to have a good time but the music was so loud I couldn't hear or speak to my children so it took away from sharing the experience. La tripulación es excelente no dejan de preguntarte si necesitas algo. Almuerzo muy bueno, el Desayuno ok. This was an awesome trip. They take care of you the whole day! Free drinks, snorkeling, music. What a great day adventure to a beautiful island. Snorkeling was great. It was a cool day and we had a lot of fun. Enough time to go shopping, lay out on the beach and just enjoy Cancun. I would recommend this tour 100%. The guides were awesome, friendly, helpful, and energetic. The day started with hotel pick up and a continental breakfast. Pick up was late enough that we were able to eat a full breakfast at the hotel, which gave us time to take pictures and walk around the port area before boarding instead of trying to eat. We boarded and were introduced to our crew. We quickly came to the first snorkeling spot and were cautioned about only going if we were strong swimmers. I think if you follow directions as long as you can swim you'd be okay. Returning to the boat it became a party boat, drinks were flowing and dancing by crew and passengers commenced. Lunch was a buffet with a lot of options, I'm vegetarian and still was full. Playa Norte was the next snorkeling spot and it was awesome. Headed to the downtown Isla Mujeres and was tired. Getting back on the boat the crew was ready to keep us awake and lively. One dressed as a Luchador and another wearing a Sarape and Sombrero. It was easy to see other people boarding other tour boats wanted to be on our boat. The dancing of the crew continued and we were also entertained by Mini Batman on the return to the port. We got back about 7 PM, a day full of fun and new experiences well worth every penny on this trip. Isla Mujeres was by far the most fun I've had on the tours I've taken. The staff were extremely hospitable and went out of their way to make sure every minute was enjoyable.They played music throughout the boatride and the MC- yes they had an MC on the boat!, kept everyone entertained. There was never a shortage of drinks for those who don't get seasick and dancing was encouraged. I appreciated all the stopovers we took and all the activities planned. The current was a little too strong for me so I didn't snorkel but those who were brave enough said they enjoyed it and saw lots of fish. Isla Mujeres itself is a beautiful island. I liked that there was enough time between each activity to explore on our own. The food during lunch was amazing! I was well-fed and again, drinks were readily availiable. This day-trip was well-planned and I appreciate the time the staff took in ensuring everyone had a memorable time. Definitely, highly-recommend everyone go on this day-trip. This tour was AMAZINGGGG!! The crew was very fun and made everyone feel comfortable. The money was worth every moment on the ride to the island. Also very educational and I would recommend it to everyone. If you want to come learn and have a great time I’m cancun.. get this package. This day trip is absolutely amazing best day every, it is a very long trip from Riveria Maya and in totally the day was over 12 hours, but well worth it!